Miscarriage, depression, breast cancer, abuse, divorce, addiction, and other specific personal, chronic problems touch the lives of many Catholic women. While expert advice is plentiful, what so many women want is not the words of professionals but the comfort that comes from knowing that someone else has suffered the same struggles and has been able to find God in the midst of the storm. Holding Hands with God provides that comfort. A compilation of stories about pain and redemption, this is a woman-to-woman approach of personal witness. Each of the contributors shares the painful realities of her life, but she shares more than that: she shares the ways God has reached her to give new insights into the nature of her cross and to provide her with comfort, acceptance, and peace. 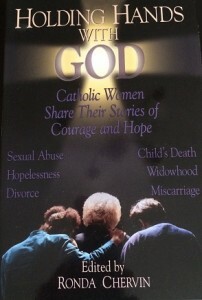 These inspiring stories from women of all ages and all walks of life are sure to encourage you to brave your own suffering by ‘holding hands with God’ in the darkness.